Apr 2019 | Maggie Reiter, M.S. ; Kai Umeda, M.S. ; and Worku Burayu, Ph.D.
Editor’s note: This research was funded in part by a grant from the United States Golf Association. Golf course superintendents are facing increased pressures to reduce inputs of water, fertilizer, pesticides and labor while maintaining turfgrass quality and playability. Although some of these pressures are environmental, such as poor water quality or lack of water availability, others are social, including legislative restrictions, economics and an increasing desire to conserve natural resources. To address these demands, many superintendents are interested in using alternative plant species that perform well under ultra-low-input management. The rough makes up the largest percentage of maintained golf course turf, and it is often the most practical turfgrass to replace on a large scope, especially in rough areas that are seldom in play and not worth the inputs required for maintenance. Alternative grass or forb species exist that could provide a minimal-input, naturalized area without impairing playing conditions. However, there are significant unknowns associated with the adaptation and establishment of alternative grass species, including plant material selection, seeding rates and irrigation requirements. To help superintendents determine which alternative species perform well as reduced-input golf course rough, we undertook separate studies in California and Arizona, evaluating 27 plant species at five locations. We collected data to determine establishment success and suitability of these species, including metrics for green color, density, stand height, uniformity and aboveground biomass. Four of 27 plant species were tested in both California and Arizona. Table 1 presents the common and scientific names, plant type, trial location and seeding rate of each of the 27 species tested. In California, three field trials — two in Parlier in Fresno County and one in San Luis Obispo — measured the performance of 10 cool-season grass species and 10 warm-season grass species. Plots were 60 square feet (5.5 square meters) and arranged in a randomized complete block design with four to five replications. Cool-season trials were established in fall 2017, and warm-season trials were established in summer 2018. Data were collected to measure establishment success, playability and stand health with the following metrics: normalized difference vegetation index (NDVI), or green reflectance; plant density counts (established plants per area); and stand height. NDVI was collected with a GreenSeeker handheld crop sensor, and plant density counts were collected with two quadrats per plot. Data were collected when plots reached maximum stand height, which was six months after seeding the trials for cool-season grasses and four months after seeding the trials for warm-season grasses. In Arizona, two field trials — one at Camelback Golf Club in Scottsdale and one at Briarwood Country Club in Sun City West — measured the performance of nine warm-season grass species, a native forb and a newly introduced horticultural ground cover. Plots were arranged in a randomized complete block design with three to four replicates. The trial in Scottsdale was established in spring 2016, and the trial in Sun City West was established in summer 2017. Data were collected to measure establishment success and stand health with the following visual ratings: greenness, percent ground cover and growth uniformity. The quality ratings were collected on a 1-9 scale, with 9 representing excellent quality and 1 representing poor quality. Greenness ratings were collected on a similar 1-9 scale, with 9 representing dark green and 1 representing brown color. In this study, “acceptable” entries had ratings greater than 5. 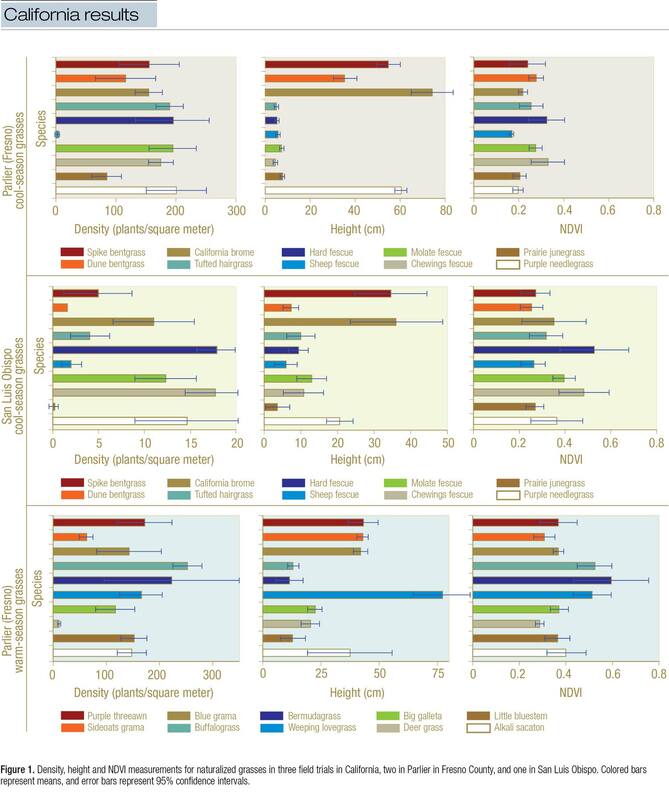 We rated the visual ground cover of plots on a scale of 0-10, with 0 representing no vegetative cover and 10 representing complete coverage of the area with no visible soil. The weekly data were combined for each site. Evaluation of low-maintenance grasses is difficult because there is no consensus on what is ideal. We evaluated grasses using different criteria in each state. In California, we examined grass density, height and NDVI measurements, while in Arizona, we examined uniformity, coverage and greenness. The results of this research are presented in Figure 1 for California and Figure 2 for Arizona. Top-ranking entries for NDVI were the bermudagrass, buffalograss, weeping lovegrass and the fine-leaved fescues, except for sheep fescue. Established plant density (plants per area) was lowest for deer grass, sideoats grama, prairie junegrass and sheep fescue. At maximum stand height, weeping lovegrass, purple threeawn, sideoats grama, blue grama, alkali sacaton, California brome and spike bentgrass reached relatively taller heights (greater than 12 inches [30 centimeters]). Big galleta, blue grama and Kurapia exhibited the best uniformity and coverage over both locations in Arizona. Kurapia, alkali sacaton, blue grama, plains lovegrass and alkali muhly entries remained green throughout the year. A naturalized grasses and ground cover species trial established in Scottsdale, Ariz., in spring 2016. At the Scottsdale site, Kurapia, plains lovegrass, alkali sacaton, blue grama, big galleta and alkali muhly performed well for all quality parameters measured. At the Sun City West site, big galleta, blue grama, Kurapia and sand dropseed performed well for all quality parameters measured. Field observations at both sites indicated that Kurapia was aggressive and vigorous as a ground cover. Kurapia also exhibited the best mowing quality and produced flowers when not mowed. Although the studies in California and Arizona employed different experimental methods, the combined results provide insight into the potential utility and effectiveness of the different plant species for naturalized, reduced-input golf course rough. We present a discussion to help superintendents interpret the results for their locations and goals, not to recommend a specific species. On a golf course, green color of vegetation is often an important factor for stakeholders such as golfers or homeowners (4). Our research indicates that hard fescue, Chewings fescue, Molate fescue, Kurapia, bermudagrass and weeping lovegrass exhibited relatively higher measurements of green color. 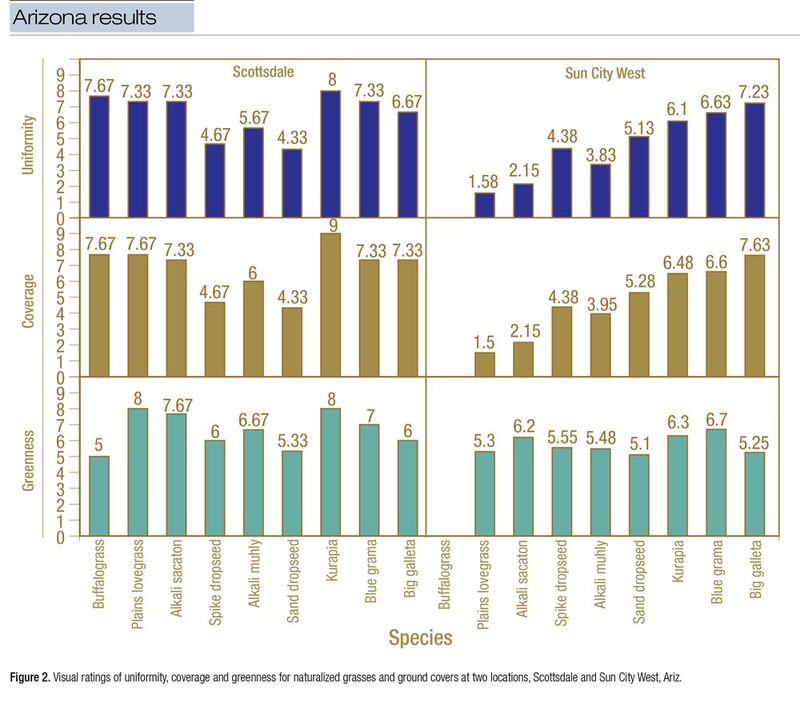 Blue grama had a higher ranking for green color across sites in Arizona, but not in California. 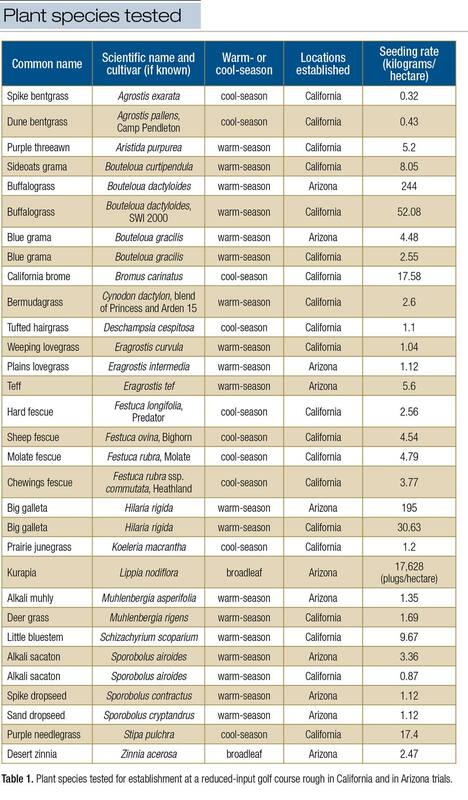 On the other hand, buffalograss had a higher ranking for green color in California, but not in Arizona. Our data suggests green color or reflectance may be influenced by site-specific conditions. A low established plant density or coverage may not be desirable for golf course roughs because it leaves exposed soil and provides opportunity for weed encroachment (3). Our data reveal that sheep fescue, prairie junegrass, deer grass, sideoats grama, spike dropseed and sand dropseed established poorly in field conditions and do not show promise for establishment from seed. However, there may be cases where low plant density is desirable for maintaining playability (1). In reflecting on this research, we realized that additional considerations may be useful to golf course superintendents. We observed that uniform irrigation was required to obtain even seed establishment and full plot area coverage. We often think of naturalized plant species as drought-tolerant plants, but superintendents should be aware that consistent irrigation is necessary for successful establishment. Previous research has demonstrated that lack of water is often a cause of seedling mortality in native and naturalized plants (5). In terms of stand height, superintendents should consider how vegetation can impact playability. For example, in playable areas, higher stand height can obstruct visibility of golf balls, and plant density can hinder the ability to find golf balls and thus affect pace of play (1, 2). Continued research replicated over locations and seasons is needed to obtain more reliable information about each species’ desirable growth characteristics, required inputs and integrated pest management requirements. California research was funded by the United States Golf Association. Arizona research was funded by the United States Golf Association, United States Department of Agriculture Specialty Crop Block Grant and the Horticultural Research Institute. Alternative plant species that perform well under ultra-low-input management can help conserve resources. In California, low-maintenance grasses were examined for grass density, height and NDVI measurements. In Arizona, grasses were examined for uniformity, coverage and greenness. Uniform irrigation was required to obtain even seed establishment and full plot area coverage. Superintendents should consider how stand height and plant density can impact playability. Doak, T. 1992. The Anatomy of a Golf Course. Burford Books, Short Hills, N.J.
Jackson, D.B., S.D. Kelly and R.D. Brown. 2011. Design guidelines for integrating amphibian habitat into golf course landscapes. Landscape and Urban Planning 103:156-165. McCarty, L.B, J.W. Everest, D.W. Hall, T.R. Murphy and F. Yelverton. 2001. Color Atlas of Turfgrass Weeds. Ann Arbor Press, Chelsea, Mich.
Moeller, A. 2013. Irrigate for playability and turf health, not color. USGA Green Section Record 51:1-6. Moles, A.T., and M. Westoby. 2004. What do seedlings die from and what are the implications for evolution of seed size? Oikos 106:193-199. Maggie Reiter is an area environmental horticulture adviser for the University of California Cooperative Extension based in central California. Kai Umeda is a turfgrass extension agent, and Worku Burayu is a research specialist with the University of Arizona’s Maricopa County Cooperative Extension office in Phoenix.